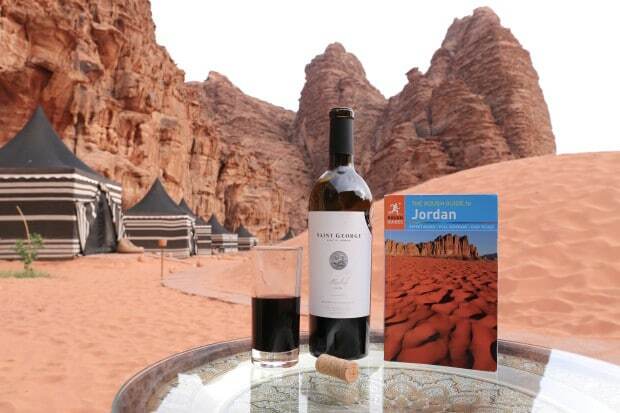 Jordan is about 85% desert, but this one simple word describes a multitude of scenes, from the dramatic red sands and towering cliffs of the far south to the vast stony plains of volcanic basalt in the east. The northern hills, rich with olive trees, teeter over the rift of the Jordan Valley, which in turn runs down to the Dead Sea, the lowest point on earth. The centre of the country is carpeted with tranquil fields of wheat, cut through by expansive canyons and bordered by arid, craggy mountains. At Jordan’s southernmost tip, beaches fringe the warm waters of the Red Sea, which harbours some of the most spectacular coral reefs in the world. 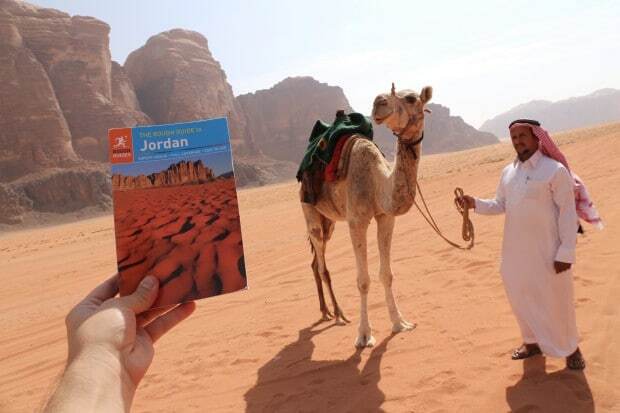 Jordan is the Middle East’s most road trip friendly destination, offering a vast variety of landscapes and experiences while also providing tourists with a safe place to explore. You’re less likely to get mugged here by locals than you are to be invited into their homes with a smile to share a cup of tea and honey soaked sweets. Many come here in search of Petra but leave most moved by the nation’s heartwarming hospitality. Planning for an epic road trip takes thoughtful planning and research. From making a list of what you want to see, places to eat, to making sure you insure your motorhome with a reliable company if you are considering staying in a static caravan on your trip or even what you will pack, everything is important when it comes to planning a successful road trip. Ensure you map out a timely route that allows you to visit the regions most famous attractions as well as hidden gems and new businesses that might have recently popped open. This past Summer I read through the Rough Guide to Jordan, scrawling several pages of notes which included recommendations for top hotels, award winning restaurants, star attractions and interesting factoids on the country’s unique history. The Rough Guide to Jordan features two suggested itineraries for the ultimate road trip (dubbed Jordan’s Great Outdoors + Culture and History). I suggest using a well researched suggested itinerary as the backbone for your road trip and then after reading up on each region in more detail you can curtail your vacation so that it fills with the tricks and treats you fancy. 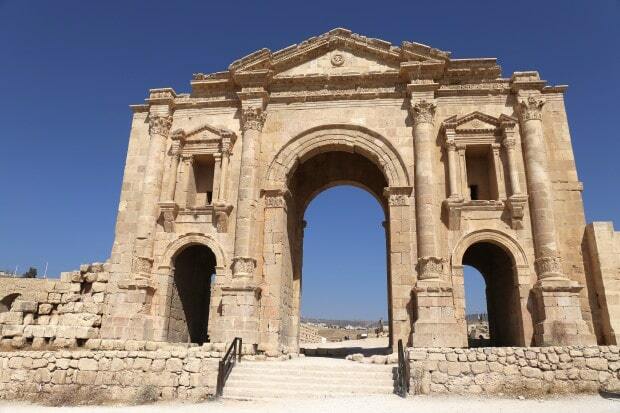 One of the best-preserved Roman cities in the eastern Mediterranean, set in the bowl of a well-watered valley about 50 km north of Amman, Jerash is one of Jordan’s most famous attractions. With its monumental and sophisticated public buildings tempered by charmingly human touches, the ancient city is likely to inspire even if you are on your jaded final leg of jet lag. 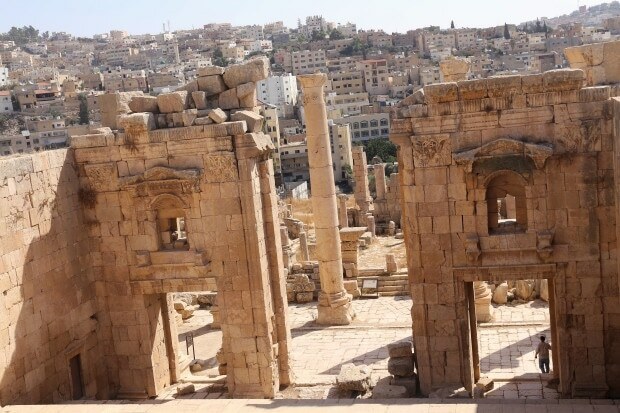 Jerash is a huge site, and easily merits a full day; if you have only a couple of hours, you could rapidly absorb the Oval Plaza – with its temple and theatre – the Cardo, the Sacred Way leading up to the Temple of Artemis and the North Theatre. Make sure you time your visit to coincide with one of the shows of Roman-style chariot racing staged in the hippodrome: they are quite spectacular! As Jordan develops into a niche ecotourism destination of world renown, so one small project rapidly gaining a reputation as the country’s – if not the Middle East’s – leading example of how sustainable development can run hand-in-hand with low-impact nature tourism. Feynan, an isolated rural community in Wadi Araba at the lower western end of the Dana Biosphere Reserve, now hosts the Feynan Ecolodge, a Jordanian-owned, Jordanian-run 26-room desert hotel which has won global acclaim for both the quality of its environmentally friendly tourism product and the way in which it has established a sustainable socio-economic partnership with the local people. 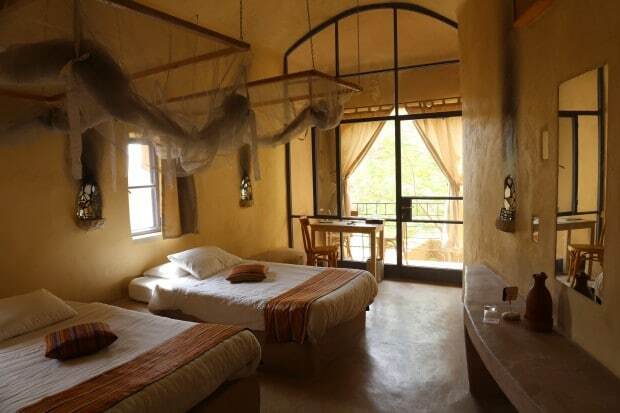 Situated miles from any road, the ecolodge is not somewhere to stumble across. Book to stay here, though, and you gain access to a world that is effectively otherwise closed to outsiders: ordinary life for rural bedouin across Jordan, largely unchanged by tourism – older generations maintaining their traditional tent-based lifestyle, younger generations making new lives in the village. Don’t come expecting Dubai-style desert luxury – it’s a long, bumpy drive to get here, across stony slopes that remain furnace-hot from May to September, and the lodge itself is charming but simple. Do come, though, expecting an atmosphere of calm, a stunning natural landscape opened up with walks and mountain-biking, an exceptionally long history evoked at remote archaeological sites, and the rarest kind of genial, unfussy service from staff who have lived in the area all of their lives. 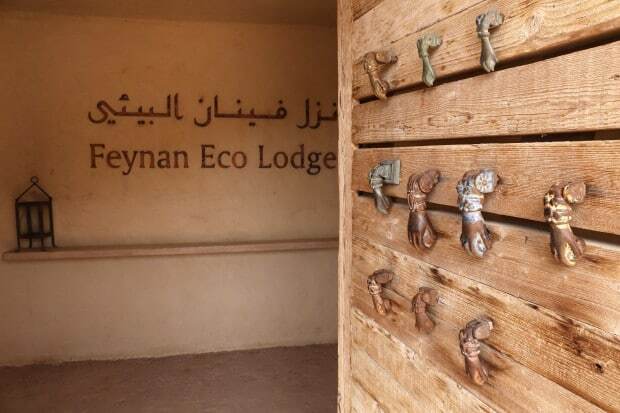 Feynan Ecolodge offers several cultural encounters so guests can enjoy the company of local bedouin families. I was welcomed into a family tent and served hot tea, with a Feynan guide on hand to explain the intricacies and significance of the tradition. As chickens clucked and and pack of goats bleated into the sunset I watched the father of the family prepare arbood, a doughy, crusty bread baked in the embers of the fire. Petra astounds. Tucked away in a remote valley basin in the heart of southern Jordan’s Shara mountains and shielded from the outside world behind an impenetrable barrier of rock, this ancient city remains wreathed in mystery. Since a Western adventurer stumbled on the site in 1812, it has fired imaginations, its grandeur and dramatic setting pushing it – like the Pyramids or the Taj Mahal – into the realms of legend. Today, it’s almost as if time has literally drawn a veil over the once-great city, which grew wealthy enough on the caravan trade to challenge the might of Rome: two millennia of wind and rain have blurred the sharp edges of its ornate classical facades and rubbed away its soft sandstone to expose vivid bands of colour beneath, putting the whole scene into soft focus. 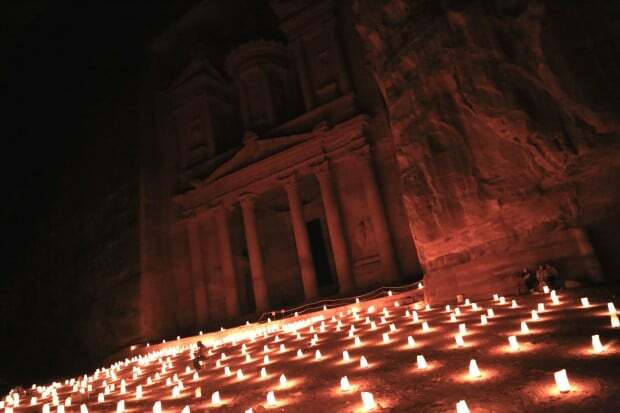 “Petra by Night” is an after-dark guided excursion into the ancient city that adds an entirely new dimension to your experience of the place; the candelit walk, leaving the lights of Wadi Musa behind to enter the pitch-dark valley in silence is magical. Nothing can match the atmosphere of walking through the Siq at night, with only the light of candles placed every few metres to guide the way. The climax comes as you reach the Treasury plaza, where candles throw flickering shadows onto the great facade as a bedouin musician plays on a pipe. The magic lingers while tea is served and you listen to a story told by a local guide. One of the most spectacular natural environments in the Middle East, the desert scenery of Wadi Rum is a major highlight of a visit to Jordan. The wadi itself is one of a sequence of parallel faults forming valleys in the sandy desert south of the Shara mountains. They are oriented almost perfectly north-south, shaped and characterized by giant granite, basalt and sandstone mountains rising up to 800m sheer from the desert floor. The rocky landscape has been weathered over the millennia into bulbous domes and weird ridges and textures that look like nothing so much as molten candle-wax, but it’s the sheer bulk of these mountains that awes- some with vertical, smooth flanks, others scarred and distorted, seemingly dripping and melting under the burning sun. Most explore Wadi Rum by spending a day in a 4X4 with a local guide. Expect to visit ancient stone etchings, canyons, rock bridges and hidden springs. If you’ve never hopped on a camel for a ride in the desert Wadi Rum may just be the most scenic place on earth to giggle yourself silly on these hilarious meandering animals. Matt Damon’s recent blockbuster The Martian was recently filmed here and it was while trotting on the back of this honking camel through rouge-sandy desert that I first began to believe I may just be trekking across the Red Planet. 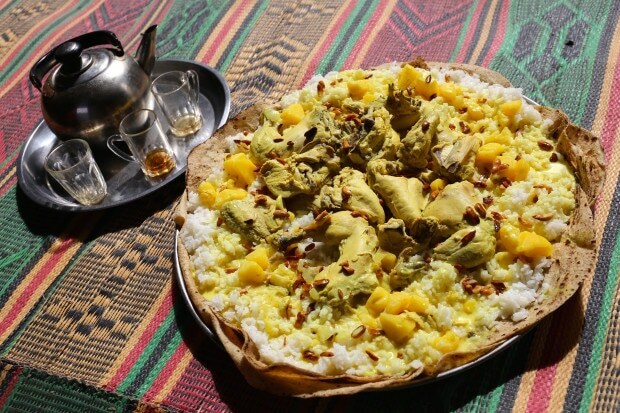 Jordan’s national speciality is the traditional bedouin feast-dish mansaf which is best enjoyed on a colourful matt thrown on the desert floor by a friendly family. The dish features chunks of boiled lamb (or chicken) served on a bed of gloopy rice, with pine nuts sprinkled on top and a tart, creamy sauce of jameed (pungent goat’s milk) on the side to pour over. Flat bread (as thin as a French crepe) is used to scoop up the steaming dish with your hands so roll up your sleeves! 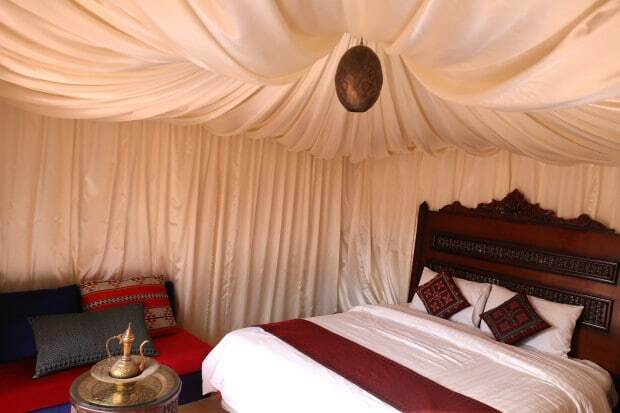 Enjoy a magical glamping experience in the heart of Wadi Rum at one of the parks luxury tented camps. After spending a full day exploring Wadi Rum by 4X4 and camel I tip toed across a petite sand dune and flopped into a comfy King bed surrounded by luxurious linens which spun towards the ceiling. The sunsets are known to be epic here so around 5pm most of the guests pop out of their tents and sit on beanbag chairs, comfortably staring up at the stars as they slowly being to illuminate the wide open night sky. Some of the world’s best diving and snorkelling is packed along the 20km or so of coastline between Aqaba and the Saudi border. The major advantages of diving here are the condition of the coral, especially below the 6m line, and the excellent biodiversity. Aqaba was a relatively slow and careful starter in dive tourism, and so has managed to avoid severe deterioration of the reefs. It’s also quiet: compared to the Sinai’s two million annual dives, and Eilat’s 750,000, Aqaba sees fewer than 20,000 dives a year. I spent the entire day touring the deep blue sea with the friendly folks at Dive in Aqaba. We started off by puttering out of the marina, past the city’s famous (and massive) Jordanian flag and sipped a hot cup of tea on the sun-splashed bow before gearing up for two dives. One of the most visited sites is Cedar Pride, a shipwreck which eerily sits on the sand below covered in coral. My 2nd dive of the day was along the coral rich First Bay where we encountered a friendly turtle and several schools of colourful fish. About 30km southwest of Madaba, at the end of one of Jordan’s steepest, squiggliest roads, Ma’in Hot Springs make for a great side-trip off the King’s Highway. Continuously dousing the precipitous desert cliffs of the Wadi Zarqa Ma’in with steaming water – varying between a cosy 40 degrees and a scalding 60 degrees – the springs (and the whole valley, which lies more than 250m below sea level) have long been popular with weekend day-trippers. The waters have been channeled to form hot waterfalls, and there are hot spa pools, natural and artificial saunas, plus full spa facilities at the adjacent luxurious Evason Ma’in Hot Springs Hotel. Ma’in truly is an oasis in the middle of the desert and its hard not to feel like you’re in paradise as water crashes through breezy palms across a delightfully hot desert landscape.